The Handsfree Goooseneck Handling System meets all governmental requirements for safe operation over open sea. No personnel over open sea is required. The system connects the kill & choke, conduit and boost hoses between the rig and the riser telescopic joint allowing for a significant improvement in optimizing this operation. It can be delivered to fit 49 1/2″ to 75 1/2″ rotary tables, and can be installed on the rig structure itself or on a moving trolley, e.g. the BOP trolley. Several systems have been delivered, and the system has successfully been in operation since 2011, with excellent operational feedback. Future Production’s Handsfree Gooseneck Handling system reduces the NPT by connecting the Kill, Choke, Boost and Conduit lines in minutes. 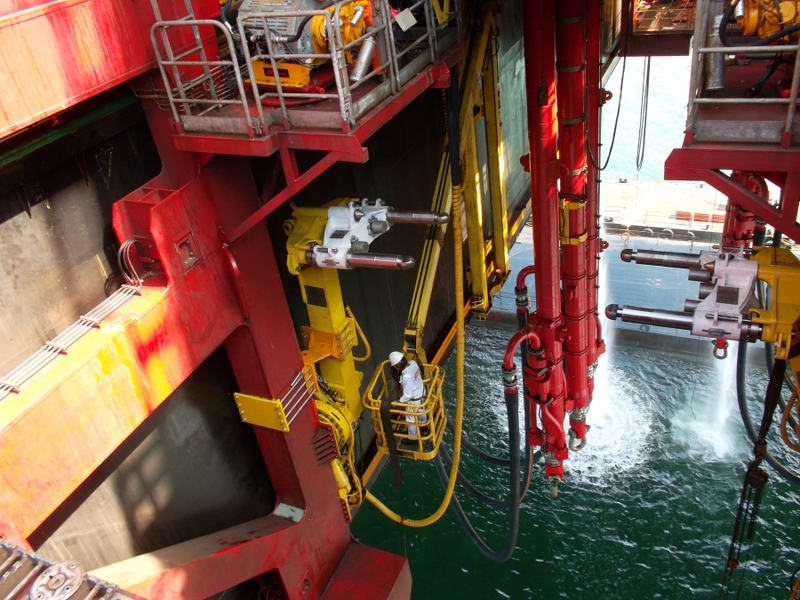 5 systems (including 10 slipjoint bodies) to 5 rigs are delivered and in operation. The first system has been onboard Scarabeo 9 for almost 7 years. It is the only proven handsfree system available in the market today, and it significantly improves HSE aspects by eliminating manual work over open sea. The GNH system connects all your BOP hoses in a matter of minutes and significantly reduces NPT. The stabbing arms are designed for easy connections and disconnections, without any need for manual operation or intervention over open sea. Significant HSE improvement. Future Production’s GNH system is robust and very maintenance friendly. All maintenance points are easily accessible. The system has no electrical or hydraulic components on the telescopic joint. The system has proven very high uptime and requiring minimal maintenance.